Diet 1 wordpress theme is a nice, yellow-greenish healthy food realted blog template. The header graphic contains a redish-pink image featuring a glas of strawberry milkshake and a female stomach with a measurer wrapped around it. This is a 3-column wordpress design with sidebars possitioned on both sides. The menu headers are white on blue background containing a little image of fruite plate. The links to pages are just below the header image. Diet 1 wordpress theme was designed by New Era Websolutions and is perfect for a healthy diet or weight loss related blog. Art Theme is an amazing wordpress template made by WPmix.com. This is a bright yellow and red wp skin featuring artistic colour spatters in it’s header graphic. It has 3 columns where both sidebars are on the right hand side. The outermost sidebar includes a list of archived pages and the blogroll while the inner sidebar includes the pages, categories and meta. Main content area is red while the blog’s background is dark blue. Silent Crystal wordpress theme is a simple, minimalist and beautiful WP design. The design is mostly white and pure css. Only the header contains some graphic – gray plants, sort of an elegant, minimalistic art. On the right side of the grass there is the blog title and tagline. Above it is the pages menu. 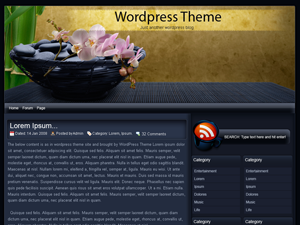 This is a 3 column wordpress skin with main content area located on the left side and two sidebars on the right. The sidebars are conjoined on top and show a menu where people can click on recent posts, recent comments and archives. 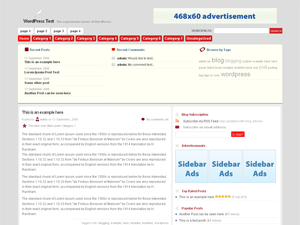 Below that there are two placeholders for advertisment banners (125 x 125 pixels). The sidebars support wordpress widgets. Silent Crystal wordpress template was designed by Italiaqui. Amazing Grace is a clean and elegant Web 2.0 wordpress template designed by Vladimir Prelovac. 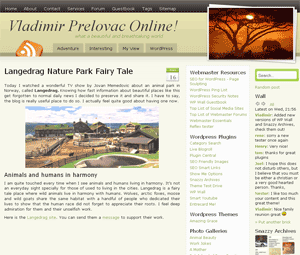 It’s a 3 column wp theme featuring beautiful nature photos on a light brown background in it’s header graphic. majority of the site is white. There are two sidebars, both are on the right hand side. Overall the worpdress theme is clean and minimalistic. Pixeled is a good looking dark, 3 column wordpress theme designed by Sam from samk.ca. The wp theme is mostly black and has white text. 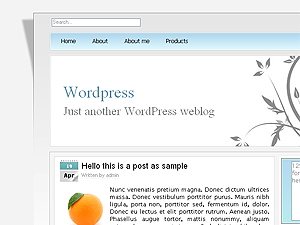 The sidebar is on the right hand side and contains all the standard wordpress sections. The search function is in the lower left corner of the wp template. Background of the header graphic resembles windows vista logon screen. Black Vivi wordpress template is an elegant dark (mostly black and gray) design suitable for just about any type of blog or website. The header contains your blog’s title and tag line aswell as pages buttons. Below are 3 columns; left sidebar, which is wordpress widgets compliant, main content area in the middle and right sidebar containing categories, archives, pages, blogroll, about and the search box. 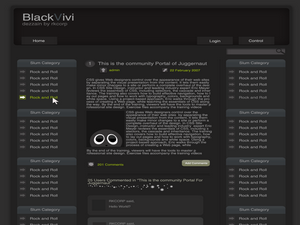 Black vivi wordpress theme was designed by Rkcorp and is free to be used by anyone. 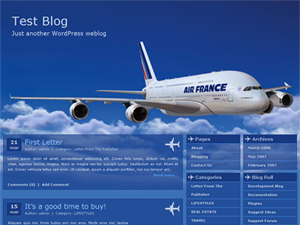 Airplane wordpress template is a beautiful blue WP design. The header graphic features clear blue sky with some white puffy clouds near the bottom and a boeing airplane from “Air France”. 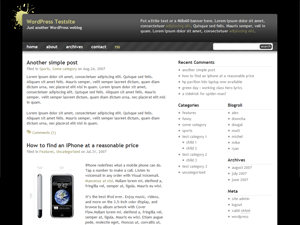 This is a fixed width, 3-column wordpress theme with main content area possitioned on the left and two sidebars on the right. The sidebars are wordpress widgets compliant. This theme has been tested on latest internet eplorer and firefox. Airplane wordpress theme was designed by wptown.com and is best suited for a travel or airplane tickets related blog.